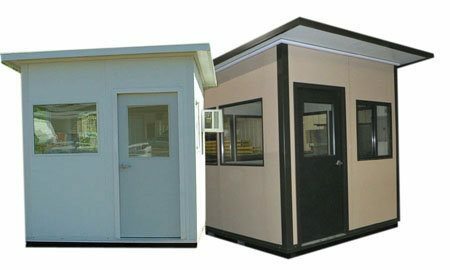 Pre-fabricated and pre-assembled guard booths, guard shacks, guard houses, modular offices and exterior buildings for sale. Panel Built pre-assembled building systems are especially suited for industrial, commercial or military space management concerns that require an immediate building solution. Pre-assembled at our factory, these interior or exterior systems are shipped direct to your site, completely assembled and ready to go to work for you. PBI has a variety of pre-assembled interior and exterior buildings. 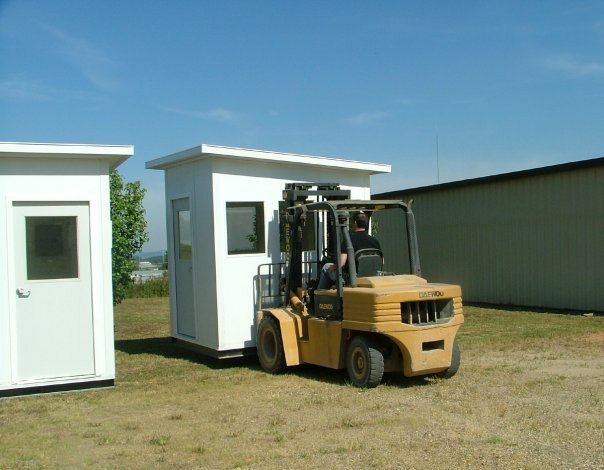 These fork or crane-liftable buildings can be moved instantly with no disassembly required and easily transported by truck to your facility. They are ready to plug-in for immediate use. Where are modular guard shacks and cheap ticket booths available for sale? Look no further! Panel built can address all of your prefab guard shack or ticket booth needs. · Guard Houses and In-plant Offices. al buildings offer outstanding quality and value. dings. Panel Built’s wide selection of panel finishes, roofing types, and accessories allow us to tailor a prefabricated building system to fit your specific needs. Expandable and moveable, Panel Built exterior modular walls allow for future growth and mobility. The system’s flexibility to withstand hurricane and earthquake conditions, speed of project construction, as well as its ability to meet tough building codes, makes it a smart choice for equipment enclosures, crane or fork-liftable metal buildings, guard shacks, storage buildings, or even a large modular office building or commercial facility. · Crane or Fork-liftable Prefabricated Buildings Built to heavy industrial standards, our fork-liftable and crane-liftable prefabricated structures offer full-depth fork pockets and welded structural steel base. · Modular Office Buildings & Commercial Metal Buildings From modular offices to retail space to commercial metal buildings, PBI can provide an economical prefabricated building solution. We offer a complete package including value engineering and design-build construction services. · Machine / Equipment Enclosures From equipment enclosures, communication shelters, and metal storage buildings to chemical containment and remote housing, PBI has a metal structure for you. · Modular Training and Classroom Facilities From large school facilities to single classroom metal buildings, Panel Built steel structures look better, last longer and are more versatile than your typical trailer unit. All Panel Built mezzanine towers, steel platforms and stair systems are power-coated for superior durability and corrosion resistance. Applications for these structures include strategic military posts, fire spotting towers, weather observation platforms, equipment operator cabins and watch stations at correctional facilities. Interior vision towers can monitor activity within a large facility, with the added benefit of leaving usable space beneath. Panel Built has constructed systems for all of these applications, as well as unique training towers and challenge course towers. Why Buy Your Gate House from Panel Built? Panel Built was founded in 1995 by brothers Pat and Mike Kiernan, and began with the construction of pre-manufactured buildings. Today, Panel Built offers a complete line of custom modular offices, mezzanines, pre-assembled and exterior buildings. All our multiple product lines are produced on site, in two state-of-the-art manufacturing facilities. We offer “A Better Way to Create Space” for all of your building projects. Panel Built Inc. is a world class manufacturer of modular offices, pre-fabricated buildings and steel mezzanines. We believe in total customer satisfaction. We pride ourselves on listening to our client’s space needs and providing creative solutions within their budgets. Our customer, dealer, and employee relationships are the foundation of our company. We strive to provide a safe, rewarding, and positive work environment to enrich the lives of our employees and their families. Panel Built modular offices and modular cleanroom mezzanines are 100% moveable and expandable. We offer many options to buy or lease, as well as assistance with financing. Matchless strength and durability, is the “core” of our building quality. Our light-weight, highly portable structural panels meet all military specifications and exceed most national building codes and OSHA requirements. Every PBI Building and Mezzanine owner is provided an exclusive warranty of our workmanship. We stand behind our products. Look no further for cheap modular guard shack companies online. Panel built products are easy to use and of top quality.